Maps of the following Wolf Den Land Trust properties are available online. A number of these properties currently have a trail system, and are open to the public for passive recreation such as birding and day hiking. No motorized vehicles are allowed. Free Adobe Acrobat Reader is needed to open PDF files. Download Acrobat Reader. JPEG files should be viewable in any image viewing software. Click on file for a full size (8 x 11) version, or on thumbnail for a larger image. Hit your "back" button to return to this page. The Mildred Bicknell Conservancy is a 30-acre property located on Westford Hill Road in Ashford, approximately one half mile northwest from the intersection of Westford Hill Road and Westford Road (Route 89). Blue Flag Meadow is a 92.7- acre property located mostly in the town of Hampton and partly in the town of Eastford. The entry to the property is located on Kenyon Road in Hampton, approximately 2.2 miles northeast from the intersection of Pomfret Road (Route 97). Fee Simple WDLT holding. The C. Vaughan Ferguson Jr. Conservancy, Lester B. Williams Memorial Forest, and Lester B Williams Memorial Forest addition are located in the town of Brooklyn. Together, these properties cover a total of 152.6 acres. Access points to these properties are located on Pomfret Road (Route 169) approximately 1.3 miles north from the intersection of Route 6, and on Herrick Road approximately one half mile west from the intersection of Pomfret Road. Ashford Merritt Gardner Memorial Forest is a 17-acre property located on Ashford Center Road (Route 44) in the town of Ashford, approximately four tenths of a mile east from the intersection of Route 89. Ostby Memorial Forest is a 83.5-acre property located in the town of Hampton. The north side of the property borders Sarah Pearl Road, approximately three tenths of a mile from the intersection of North Bigelow Road. The south side of the property borders East Old Route 6, approximately one half mile west from the intersection of Providence Turnpike (Route 6). Also see Ostby property under a Conservation Easement. The Rainsford B. Sherman Memorial Forest is a 77.9-acre property located on Breakneck Hill Road in the town of Killingly. The south and north access points to this property are located respectively approximately six tenths of a mile and approximately eight tenths of a mile from the intersection of Hartford Pike (Route 101). The north access point has a parking area and a trailhead to a trail network within the property (not shown). The south access point is undeveloped. Rainsford B. Sherman - Green Trail. Entrance is the trailhead on Breakneck Hill Road in Killingly, CT. 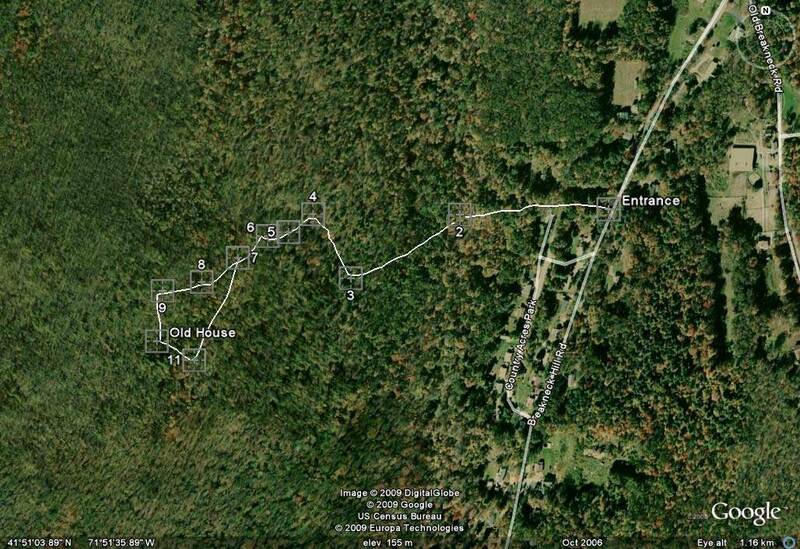 The trail from the entrance to the old house is about 2.4 miles long. The house is a well preserved foundation and chimney probably dating back to the 19th century. JPEG File. Shoemaker Demonstration Forest, The Shoemaker Demonstration Forest is a 51.4-acre property located on the Brooklyn Turnpike in the town of Scotland, approximately one half mile southwest from the intersection of Pudding Hill Road (Route 97). White Brook (Townsend) Sanctuary is a 41- acre property located on Darby Road in the town of Brooklyn. The parking area on the northeast corner of the property as shown on this map is located approximately one half mile east from the intersection of Barrett Hill Road. Canterbury Frank C. Koch Memorial Forest See article.